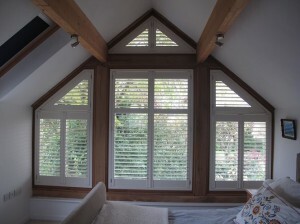 Do you need shutters or blinds for your gable end window? If I was poetic I would go on about how beautiful the autumn leaves are, fluttering to the ground as we gaze through our gable end window. But I’m not going to as it won’t be any use to anyone thinking of building their own house. Instead, I’m going impart some useful information about a solution we found for blinds to fit our gable end window. (You won’t realise how important this is until you’ve got one causing you a problem). After years of deliberation, odd bits of curtain and drawing pins, we finally saved up enough money and opted for made to measure slatted blinds www.johnlewis.com/our-services/made-to-order-shutters-from-s-craft. I am still in raptures about them, especially at night. I’m as big a fan as anyone of a lovely bright moonlit night, but when the moon hits your eye like a big pizza pie at 2 am it’s not amore I can tell you! Now to find curtains for the downstairs sunroom/dining area. There are a few big floor to ceiling windows to consider in our self-built house you see. It makes me and Mr Clark weary just thinking about it. Well, it’s a simple choice really – pay the mortgage or buy curtains. I fear another winter of discontent as we sit and watch the rain lash against the glass while it tries to sneak its way in through the oak beams and make leaky tannin stains, and most importantly we must try and not do anything untoward in that part of the room lest the new neighbours should see. You can find more top tips for self-building in my book Mud and Marriage – Available from Amazon.co.uk or from this website. This entry was posted in Book Updates, Building tips, recommendations, Self-Build, Top tips, Uncategorised and tagged autumn leaves, blinds, curtains, gable end windows, Shutters, sunroom, the mon, windows, winter on 26th October 2014 by Mandy Clark.